A little over a hundred years ago, Prof. Henry Van Dyke re-introduced the Western World to the real Magi in a beautiful fictional book, The Story of the Other Wise Man. Knowledge of the Magi as priests of the Zoroastrian religion had been forgotten after the Moslem conquest of the Middle East but had re-emerged during the 19th century. Prof. Van Dyke’s Other Wise Man, like the more famous Three Wise Men who brought gifts to honor the Baby Jesus in the Gospel of Matthew, were Magi. Theirs was the only religion in the ancient world other than Judaism to worship one God, and their prophet Zoroaster had predicted the coming of future saviors from “the nations.” The Magi believed that Salvation is attained through Good Thoughts, Good Words, and Good Deeds. In The Story of the Other Wise Man, the fourth Magi is delayed in his attempt to join the others in their search for the Savior because he repeatedly interrupts his journey to care for the sick and needy. At the end of his life, he experiences a vision of the crucified Jesus who assures him that in performing good works for “the least of my brethren, you have done it to me” (Matthew 25:31-46). Prof. John Hinnells of the University of London notes that St. Matthew, who is thought to have written his Gospel in Antioch, Syria, would have been familiar with the beliefs of the Magi, whom history locates in that community in the First Century. More than any other Gospel writer, Matthew cites texts from the Hebrew Bible to prove that Jesus was the Messiah, but inthis instance, Matthew tells us that priests from a religion other than Judaism followed the Guiding Star to Jesus. Why? One answer given is that the Zoroastrians were known to be astrologers. Remember that Balaam, another non- Jew in the Hebrew Bible (Numbers 24:17), predicted that “a star shall come forth out of Jacob and a scepter shall rise out of Israel….” But many other religions of the First Century practiced astrology. A related answer sometimes voiced is that the Magi were Chaldaens; Chaldaea, another name for Babylon, was where Western astrology was invented. 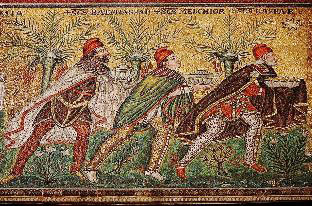 At the time of the birth of Jesus, the religion of the Magi was the dominant religion in Babylon. The Magi at the Nativity of Jesus was not the first communication between the Zoroastrian and the Jewish religions. By the time of Jesus’ birth, the Jews had been acquainted with the religion of the Magi for over 500 years! Indeed, the Magian Kings Darius, and Xerxes are mentioned fondly in the Hebrew Bible; the good Persian King Cyrus the Great was responsible for allowing the Jews to return to Jerusalem from their Babylonian exile with the treasures from their Temple. It is likely that the Magi would have known of the Jewish prophecy of a savior similar to their own. We in the West forget that early Christians lived and modern Christians still live in Africa, India, and the Middle East. Indeed, before Islam, 10% of the Middle East was Christian. The Zoroastrians and their priests, the Magi (now called Mobeds), are still with us too. In fact, there are 15,000 in North America. No other religion has as much in common with our Judeo-Christian heritage. So at Christmastime, after you read the story of the Magi in the Chapter 2 of Matthew, skip over to Chapter 25 (vs.31-46). Remember the Other Wise Man and his prophet, Zoroaster, who also taught the supreme importance of good works and who predicted the coming of other saviors.